Victoria, BC. – RaceRocks, an Education Technology (EdTech) Small Business (SMB) located in Victoria BC, has announced today that it has signed an agreement with Canada’s largest shipbuilder, Chantier Davie Canada Inc. (CDCI), and Project Resolve Inc. (PRI), to deliver a full complement of modern Technology Enabled Learning (TEL) systems for the Resolve Class Auxiliary Oiler Replenishment (AOR) ship. RaceRocks 3D Inc (RaceRocks) is a Canadian EdTech company that develops technology enabled learning systems for the aerospace & defence and the oil & gas sectors. RaceRocks has also provided learning services for various governments (B.C. & Alberta) and was competitively selected as part of the federal government’s learning services standing offer and supplier arrangement; under which it provides training directly to the Royal Canadian Navy. See website www.racerocks3d.ca for more details. Project Resolve Inc. is the Canadian At-Sea Support Services Provider, providing a fully operated Auxiliary Oiler Replenishment (AOR) ship for the Royal Canadian Navy from 2017. 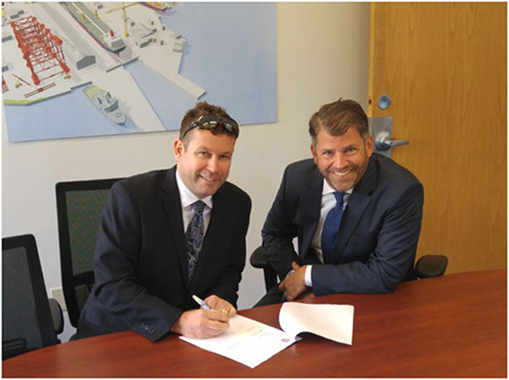 Project Resolve Inc. is part of the Inocea Group of Companies which also owns Chantier Davie Canada Inc., Canada’s largest and highest capacity shipbuilder. See www.ProjectResolve.ca for more details.